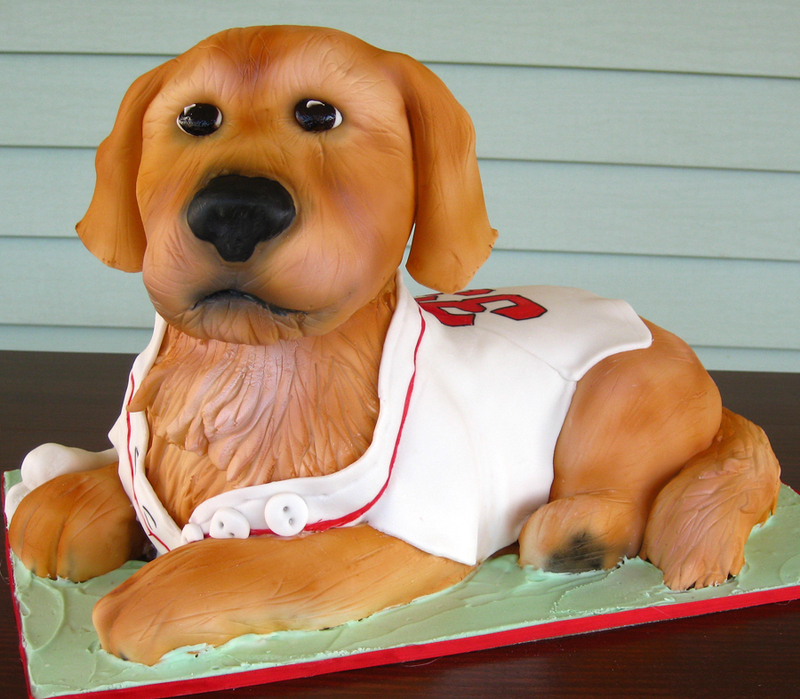 Frosting the Dog is one of our favorite sculpted cakes. After completion he was so real to us that we named him Frosting. It was such a joy to have him sitting around the kitchen watching us with his puppy dog eyes. We also enjoyed taking him for a ride in the car, aka delivery. It was a little sad to return home without him. Frosting was made for a birthday girl who was both a Red Sox fan and a lover of Golden Retrievers. Because we know many of you are curious, we’ve decided to reveal a few of our secrets behind a 3D sculpted cake. Here is the finished Frosting in all his glory. 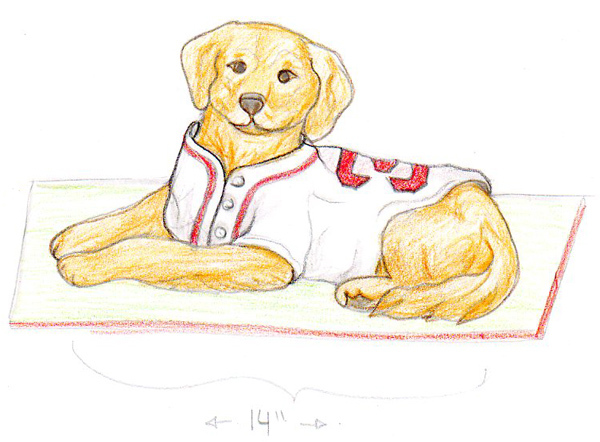 The original sketch which was sent to the client before anything was baked. This is a shot taken just after we had assembled and carved the cake layers and were just beginning the crumb coat. For the sake of keeping it lightweight we used styrofoam for the head which we sculpted and molded with modeling chocolate to reveal facial features. Every other part of the cake is edible including the rice krispie treat limbs. Here the body of the cake has been covered in fondant. We wrapped it in plastic wrap to keep it from drying out before we’re able to add the fur texture. 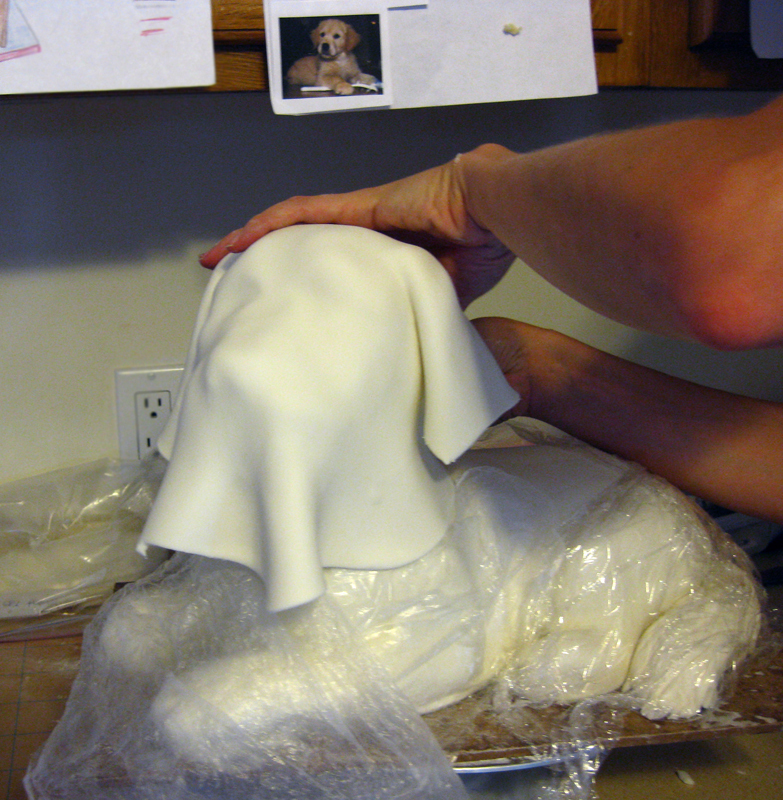 As you can see from my huge elbow, I’m covering the sculpted head in fondant, intentionally leaving folds in the fondant (which is usually a ‘no-no’ when covering a wedding cake for example) as to make the ears look more realistic. Below sits frosting after his first round of air brushing. It took many rounds of air brushing and mixing many colors to give the affect of real fur, which dose have subtle changes in color. Wow, that’s an amazing cake! Thanks, I’m always looking for new ideas – obviously not in your leage but well we can dream. What an amazing cake, where did you get the styrofoam for the head? 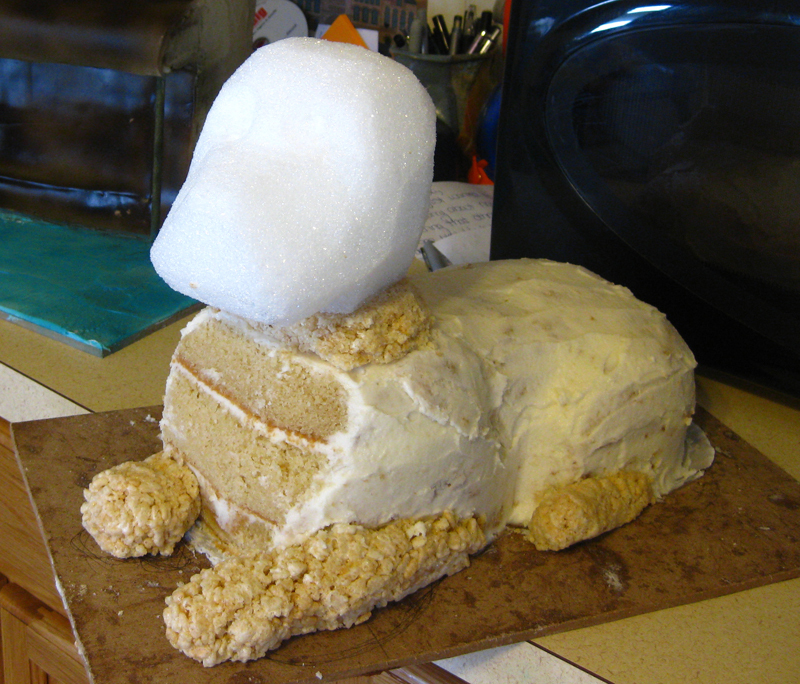 i’m going to be making a dog cake for one of my husbands family members. You can get blocks or balls of styrofoam at any craft/floral store. Wow! 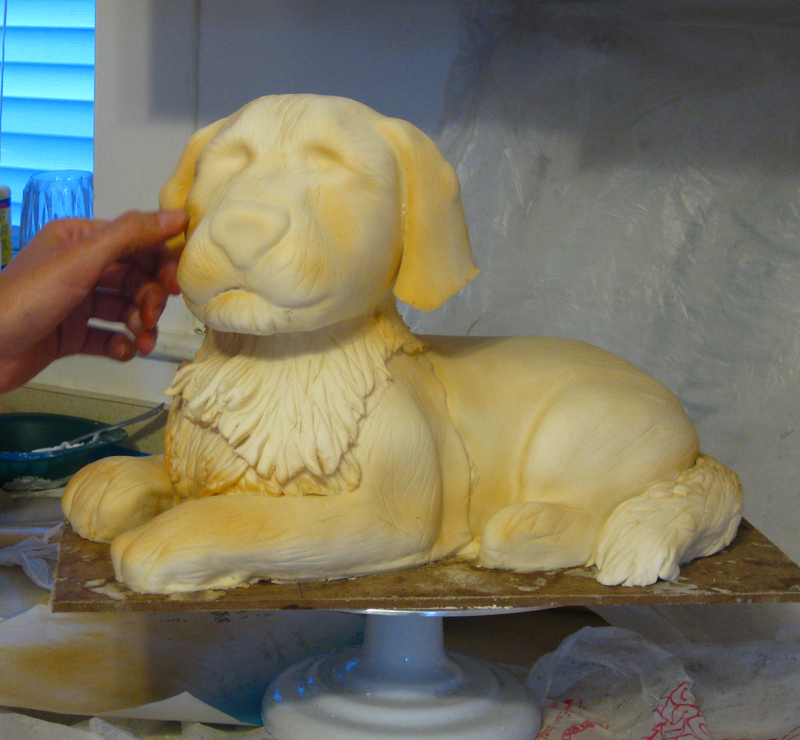 Someone asked me to make a black Labrador cake and was looking for some ideas. Thanks so much for posting this its amazing. Just a quick question, if I were making it black should I use black fondant or use grey and airbrush? I’ve never actually airbrushed before! You can knead in black gel icing color if you don’t have an airbrush. It takes a lot of color and can sometimes make the fondant over-saturated and floppy, but it is doable. Otherwise you can just fondant with white and airbrush black food coloring on the top. We find this to be more efficient. Just make sure you have proper ventilation otherwise you’ll be sneezing black for a while. 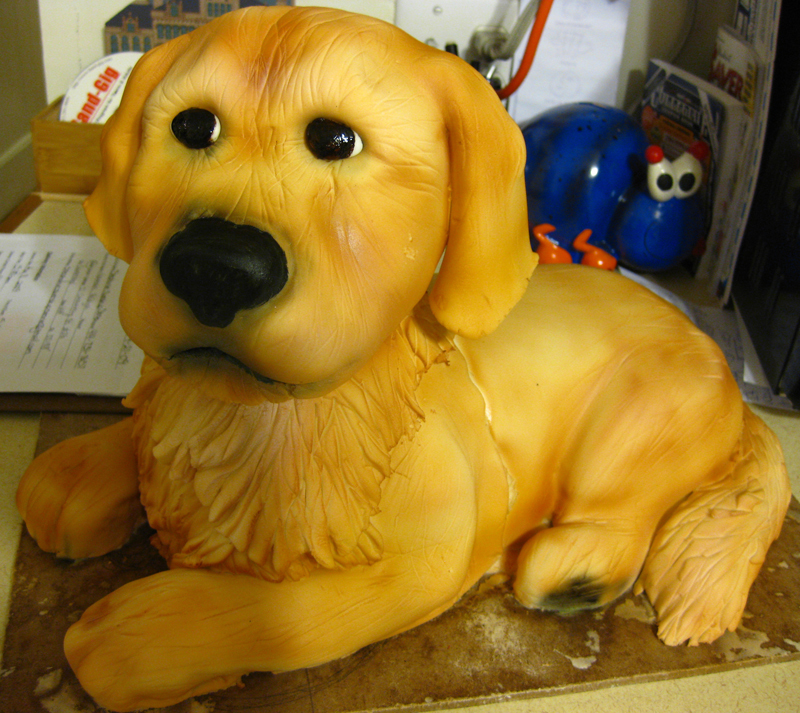 I just cam across your adorable puppy cake. You are very talented! I was wondering if you mind sharing what size pans you used for the body. I’ve always wanted to try one of these types of cakes, but just don’t know where to begin! We just piece together square pans to add up to the dimensions we need based on how large the dog is. We use Ateco airbrush food color. Thanks!